PLEASE NOTE: THE PROGRAM OPTIONS AND RESERVATION FORMS IN THIS SECTION ARE AVAILABLE EXCLUSIVELY FOR PUBLIC SCHOOL DISTRICTS AND K-12 PRIVATE SCHOOLS. Mother’s Day Out programs, churches, daycares and all community organization groups need to contact the DHDC Reservations Department at 806-355-9547 x107 or reservations@dhdc.org for group rate information and reservations. Thank you for your help in expediting the reservations process for all of our guests! Reserving Your Event is as easy, as 1, 2, 3! Fill out a reservation request for your selected program using the links in the section below. Watch your email for communications from DHDC regarding reservation requests or scheduling conflicts. Please allow 3 business days after your submission date to process your reservation request. Your event is confirmed once you receive your DHDC Confirmation Form via email. For field trips, please print a copy of your confirmation form to present to the front desk upon arrival. Have a question or need to change your reservation? Just contact our Reservations Department at reservations@dhdc.org. Should you need to reschedule or cancel your reservation for any of our programs, a minimum of 72 hours’ notice is appreciated. Reservations cancelled with less than 72 hours’ notice, and/or failure to arrive for your reserved event may result in a cancellation fee (up to the full cost of the reserved program of visit) being assessed to the campus. Due to demand, Education Event registrations (excluding competitions) cancelled within 2 weeks of the event will be assessed a cancellation fee equal to the full cost of the event reservation, unless the cancelled space is filled by a group on the wait list. Exceptions to this policy will be made in cases of inclement weather. Reservation requests must be received a minimum of 3 weeks in advance of your requested visit date. A minimum of 10 students per visit is necessary to qualify for school group rates. Minimum count is waived for student groups with special needs and any district participating in our Education Partner Program. Pricing options are available for classes of less than 10 students. Contact DHDC for details. 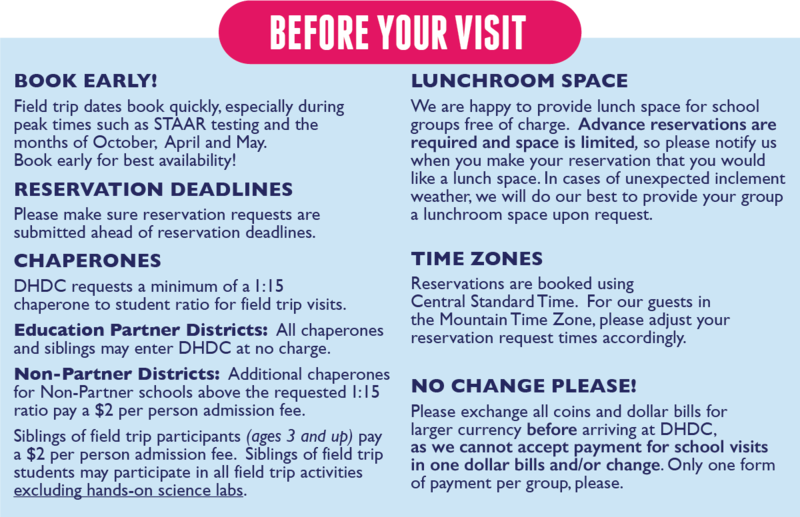 Every student and chaperone in the group will be counted and charged as part of the group admission fee, even if the family has a personal DHDC membership. 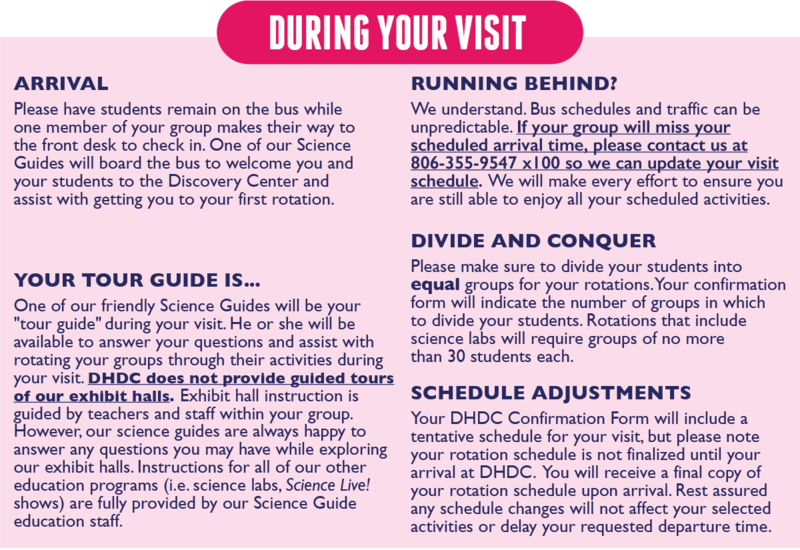 DHDC will set a rotation schedule for your group. Simply select the programs you’d like to include in your visit and we’ll take care of the rest! 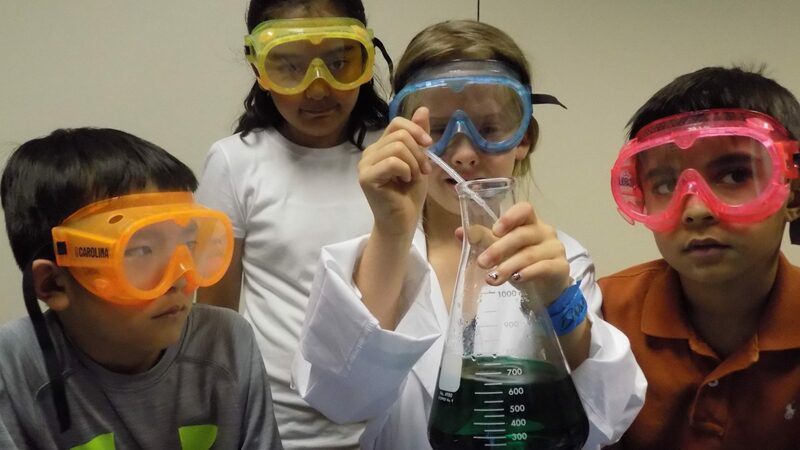 Reservation forms for Education Events (ChemiCon, Egg Drop, DHDC Christmas Spectacular, etc.) are located on the Education Events page. Reservation deadlines vary by event – see Education Events page for details. Registrations will close early as events reach capacity. Limited space is available for each Education Event and dates fill quickly – book early to secure your group’s space. Please note special Event cancellation policy above. Reservation requests must be received a minimum of 4 weeks in advance of your requested visit date. Reservations for free Education Partner District shows must be approved by campus principal. Please review your selected show’s logistic requirements prior to booking. Some shows have class size and/or travel distance limits. Please see the Science Live! page for details. To reserve a custom show date and time, click here. To choose from a list of scheduled show dates and times, click here. – link coming soon. Reservation requests must be received a minimum of 4 weeks in advance of your show date. No minimum audience size, maximum audience per program is 500 participants. It is the responsibility of the teacher to ensure the minimum technology requirements are met prior to booking. See the Distance Learning page for details. Reservation requests must be received a minimum of 4 weeks in advance of your lab date. Up to 36 students may participate in each scheduled lab session. DHDC instructors will teach each lab. See the Mobile Labs page for details. Reservation requests must be received a minimum of 2 weeks in advance of your delivery/pick up date. Kits may be kept for up to 3 weeks. Please review pick up/delivery options on the Discovery Loan Kits page prior to booking. Teachers are responsible for returning Loan Kits to DHDC on or before the due date. A credit card number is required at time of reservation as deposit. Cards are not charged unless there are late return fees or damaged of missing equipment upon kit return.